The historical relationship between film and videogames is both overdiscussed and underanalyzed; structured from the start by assumptions about the two mediums’ simultaneous affinity and alterity–what they share and what sets them apart–the narrative of their coevolution over the last forty years seems caught up in conceptual paradoxes whose unresolvability traps the conversation in a kind of eternal present tense in which successful fusion is always right around the corner. 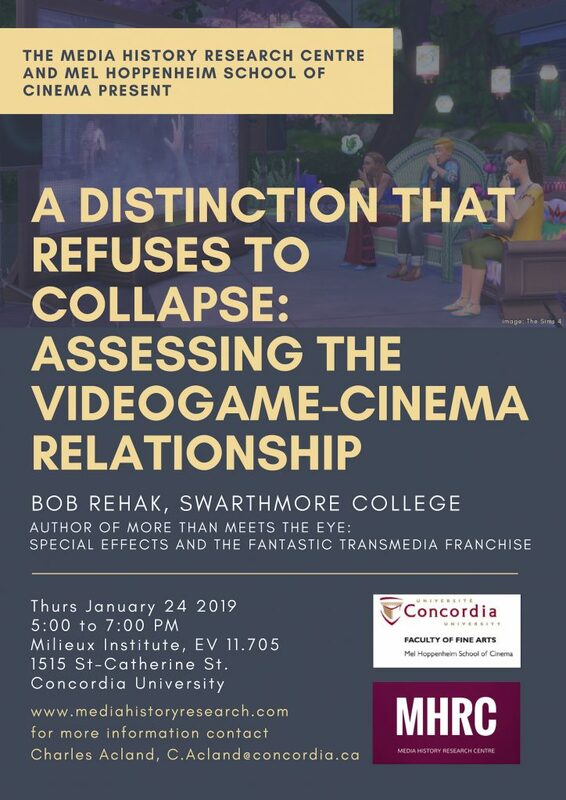 Taking a cue from special effects studies (which similarly diagnose an imminent yet ever-deferred arrival of “perfect” graphical simulation), I seek to move past conceptual roadblocks about the videogame-cinema relationship by cataloging and debunking their most common tropes. In so doing, the talk highlights certain problems of “doing” media history in an era of massively promoted technological sublimity and triumphalist capitalism: market-friendly and audience-flattering mythologies symptomatically expressed in the language of transmedia worlds and brands. Bob Rehak earned his B.A. in English from Eastern Michigan University in Ypsilanti (1992), his M.A. in Communication Studies from the University of North Carolina at Chapel Hill (2000), and his Ph.D. in Communication and Culture from Indiana University at Bloomington (2006). His scholarship has appeared in Cinema Journal, Film Criticism, the Journal of Fandom Studies, Science Fiction Film and Television, and Information, Communication and Society, as well as in the edited collections The Video Game Theory Reader, Videogame/Player/Text, The Cybercultures Reader, Spreadable Media, and the Screen Decades and Behind the Silver Screen series. “In Projecting Citizenship, Gabrielle Moser gives a comprehensive account of an unusual project produced by the British government’s Colonial Office Visual Instruction Committee at the beginning of the twentieth century—a series of landern slide lectures that combined geography education and photography to teach schoolchildren around the world what it meant to look and to feel like an imperial citizen. Through detailed archival research and close readings, Moser elucidates the impact of this vast collection of photographs documenting the land and peoples of the British Empire, circulated between 1902 and 1945 in classrooms from Canada to Hong Kong, from the West Indies to Australia. Moser argues that these photographs played a central role in the invention and representation of imperial citizenship. She shows how citizenship became a photographable and teachable subject by tracing the intended readings of the images that the committee hoped to impart to viewers and analyzing how spectators may have used their encounters with these photographs for protest and resistance. Moser shows how the Visual Instruction Committee pictured citizenship within an everyday context and decenters the preoccupation with trauma, violence, atrocity, and conflict that characterizes much of the theoretical literature on visual citizenship and demonstrates that the relationship between photography and citizenship emerged not in the dismantling of modern colonialism but in its consolidation. 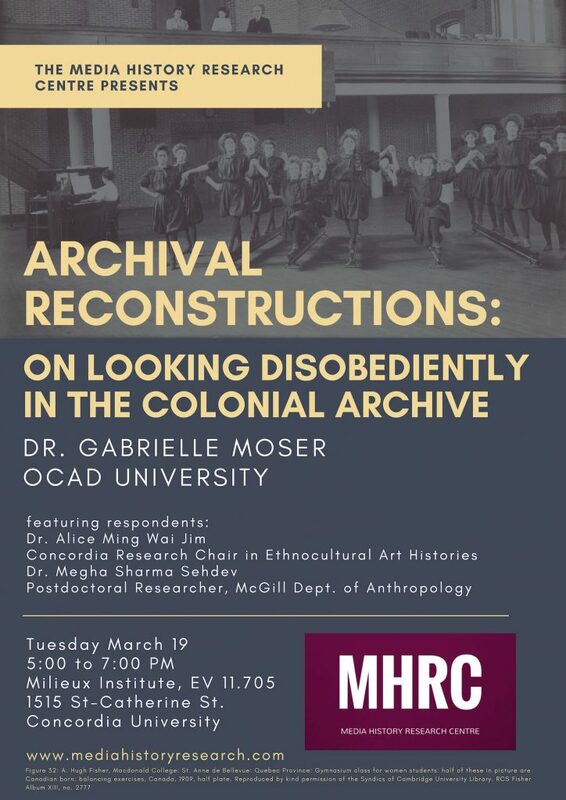 This talk will feature respondents Dr. Alice Ming Wai Jim (Concordia University Research Chair in Ethnocultural Art Histories) and Dr. Megha Sharma Sehdev (Postdoctoral Researcher, McGill Dept. of Anthropology). Gabrielle Moser is a writer, educator and independent curator. She is the author of Projecting Citizenship: Photography and Belonging in the British Empire (Penn State UP, 2019) and her writing appears in venues including Artforum, Canadian Art, Journal of Visual Culture, Photography & Culture, and Prefix Photo. Moser has held fellowships at the Paul Mellon Centre for the Study of British Art, the Ryerson Image Centre, the University of British Columbia and was a Fulbright Visiting Scholar at Brown University in 2017. She holds a PhD from the art history and visual culture program at York University in Toronto, Canada and is an Assistant Professor in art history at OCAD University. The contribution of Canadian scholars Carpenter, Innis and McLuhan to media studies has been widely acknowledged worldwide, almost to the point of canonization. In the Toronto School’s shadow, however, other minor intellectual paradigms in the country also sought to address the complex relationship between culture and technology in the postwar era. Among those was “mechanology,” or the “science of machines,” first outlined by the French engineer and architect Jacques Lafitte in his book, Reflections on the Science of Machines (1932), and later recovered by two Canadians in the 1960s, essayist and filmmaker Jean Le Moyne and computer scientist John Hart. Centering on their collaboration, the revival of mechanology in Canada sought to bring about a renewal in humanist thought by introducing technology as paramount and essential to human culture. Through their interaction and engagement with the work of artists, such as Glenn Gould and Greg Curnoe, and philosophers, such as Gilbert Simondon and Georges Canguilhem, Le Moyne and Hart outlined a project that aspired to bridge the humanities, applied sciences, and the arts. 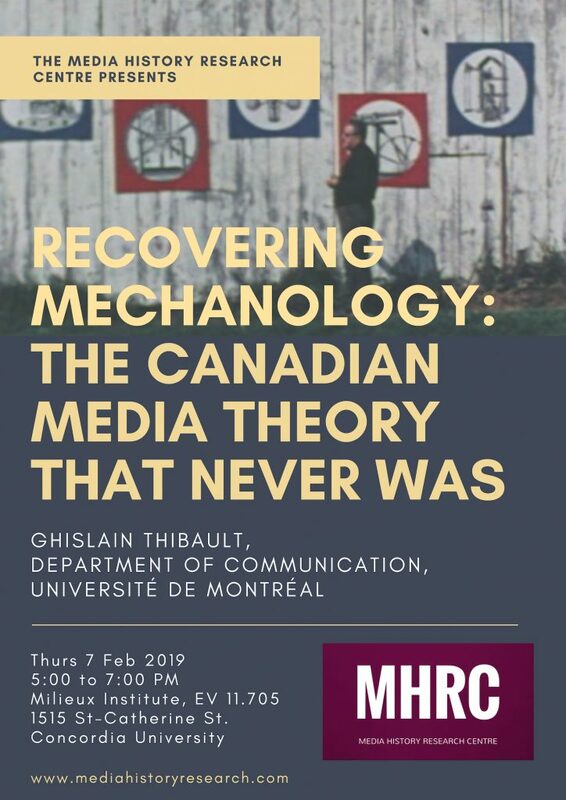 Tracing the development of this now forgotten science of machines provides a way to reexamine the intellectual and political context out of which Canadian media theory gained significance nationally and internationally. Moreover, mechanology’s failure to become as visible as cybernetics or media theory offers a meaningful site for thinking the pivotal cultural and technological changes that marked the shift from energy to information machines in the second half of the twentieth century.